Ascending Butterfly: Todays Inspiration: Impossible and Un-attainable, or is it? 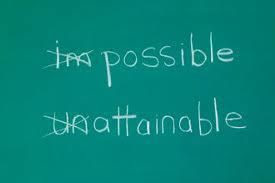 Todays Inspiration: Impossible and Un-attainable, or is it? It's truly just a matter of perspective, isn't it? Weekend Challenge: Dust off a goal or dream that you feel is impossible or un-attainable for you right now. Re-examine it. If that goal were the goal of a family member or dear friend would you tell them it's impossible? Would you tell them they couldn't reach it? Then why can't YOU? What goal have you given up on that you'd now like to re-consider? I'll share mine if you share yours! Have a wonderful weekend, and stay inspired Butterflies!